This is the monthly UK House Affordability update, which is the metric that I believe is the key driver of UK House Prices. It also updates UK House Value which is the metric I am using to assess when it is time to buy a UK home and Sales Volumes. The last update can be found here. UK Nominal House Prices. There are numerous UK House Price Indices which each measure something different. 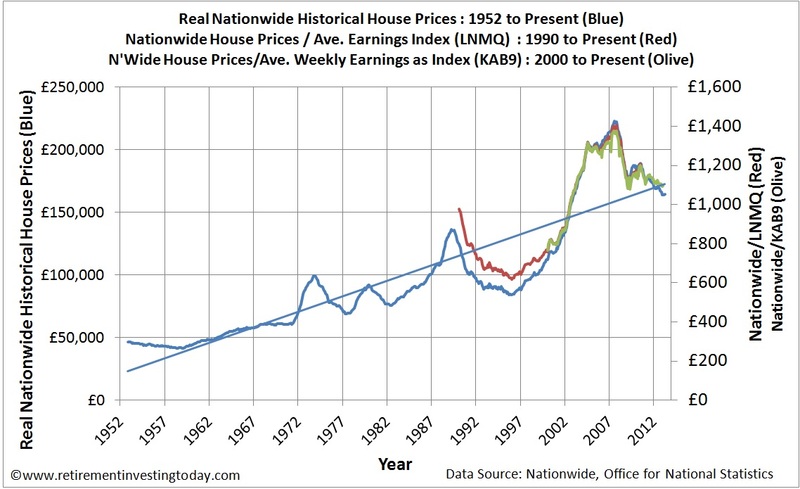 This analysis has always used the Nationwide Historical House Price dataset which measures the price of a Standard House and so this month we stay with that for consistency. March 2013 house prices were reported as £164,630. Month on month that is a rise of £1,992 (+1.2%). Year on year also sees an increase of £1,303 (+0.8%). 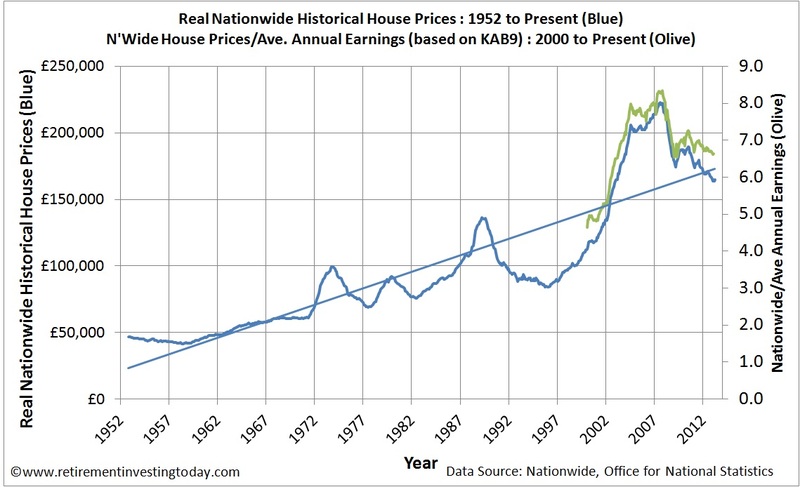 UK Real House Prices. If we account for the devaluation of the £ through inflation (the Retail Prices Index) we see a different picture. Month on month that increase of £1,992 turns into an increase of £810 (+0.5%). Year on year that £1,303 increase turns into a decrease of £4,525 (-2.8%). In real terms prices are now back to those around January 2003. UK House Sales Volume. 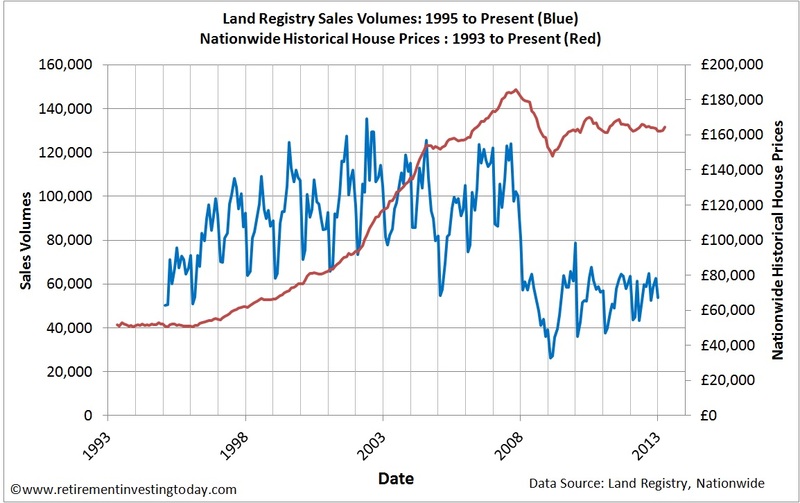 Sales volumes according to the Land Registry were 53,860 in December 2012. Month on month that is a fall of 14.0% and year on year a fall of 15.3%. Volumes are now 40% of peak sales in May 2002 and 66% of the dataset average volume. UK Nominal Earnings. I choose to use the Office for National Statistics (ONS) Average Weekly Earnings KAB9 dataset which is the seasonally adjusted average weekly earnings of both the public and private sector including bonuses. January 2013 sees earnings at £470. Month on month that is a nominal decrease of £2 (-0.4%). Year on year sees a nominal increase of £5 (+1.1%). With inflation (the Retail Prices Index) running at 3.3% over the same yearly period the purchasing power of those that work continues to be eroded. UK Mortgage Rates. The proxy I use to monitor mortgage interest rates is the Bank of England dataset IUMTLMV which is the monthly interest rate of UK resident banks and building societies sterling Standard Variable Rate (SVR) mortgage to households (not seasonally adjusted). February 2013 sees a mortgage rate of 4.4% which is flat month on month and year on year is an increase of 0.26%. While this metric sees mortgage rates increasing a number of mortgages are seeing falls largely because of the Funding for Lending Scheme (FLS). 2, 3 and 5 Year Fixed Rate Mortgages with high 25% Loan to Value Ratios (LTV) requirements have seen year on year falls of between 0.5% and 0.59% and at 2.87% for a 2 year effectively mean negative real interest rates. The stock market uses the Price to Earnings Ratio (P/E) as a possible valuation metric. I choose to use the same metric to assess housing value and show this in my first chart below. For Price I use Nominal House Prices and for Earnings I use the UK Nominal Earnings multiplied by 52 to convert to Annual Earnings. This shows that today we are sitting on a P/E of 6.6 which is identical to last month. While being a long way off the peak value 8.3 we are also still far from the 4.6 seen in January 2000. Unfortunately, the Average Weekly Earnings dataset limits this analysis to January 2000. I however want to look at longer term trends to try and judge where fair value may be and even what P/E lows we could expect going forward. To get an indicator of this I use an older similar dataset which was discontinued by the ONS in September 2010. This was the Seasonally Adjusted Average Earnings Index (AEI) for the Main Industrial Sectors. This dataset goes back to 1990 which is sufficient to take us back through the last UK property bust. I then convert the Average Weekly Earnings dataset to an index and overlay both on the chart below. This shows that today we are still nowhere near fair value. I believe that the Average Joe out there doesn’t have any concept of house price value and instead is just interested in how much he can borrow from the bank which is effectively Affordability. I track Affordability using a dataset I have created which I call the UK House Affordability Ratio. I define this as the Ratio of Average UK Monthly House Repayments to Average UK Earnings at the point of the mortgage being granted. Let’s first calculate the Average UK Monthly House Repayment. 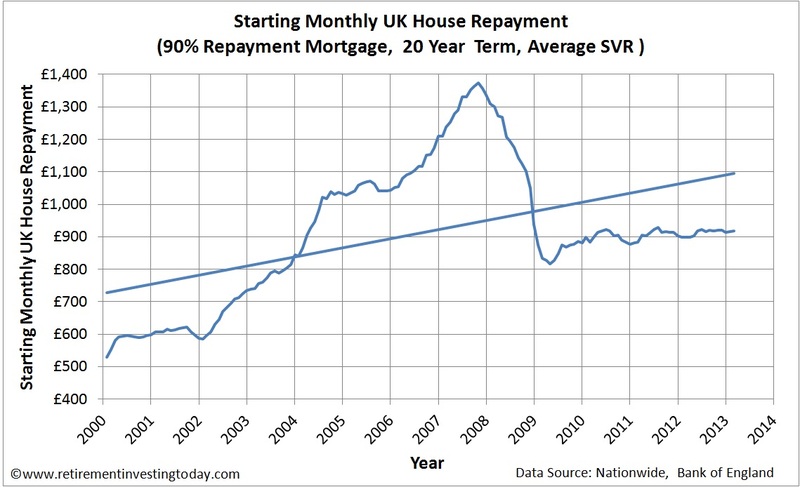 This is calculated by taking the Nationwide dataset, the Bank of England’s SVR dataset along with assuming a 20 year, 90% repayment mortgage (the actual value isn’t overly important as it is held as a constant through the dataset for comparison purposes) and is shown in the chart below. This can only be calculated to February 2013 as this is the last date for which mortgage rates are available. During this period house prices rose by £392 month on month. The small increase in house prices combined with a flat Standard Variable Rate sees the Monthly House Repayment increase from £915.94 to £918.15 month on month. 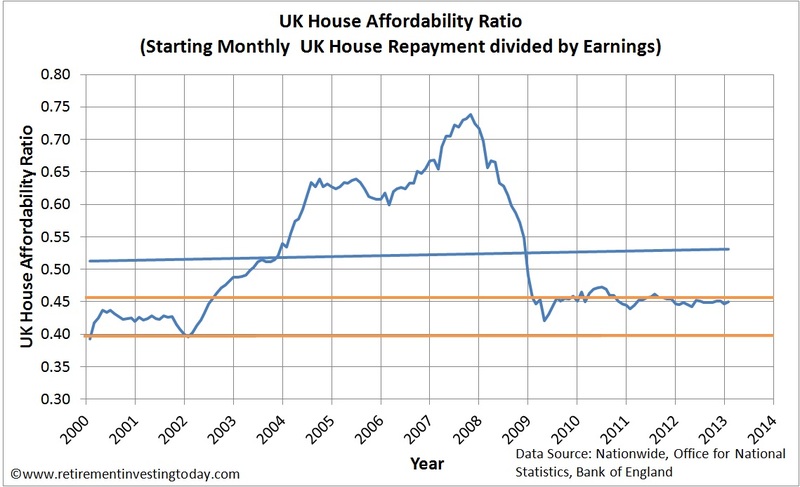 We then ratio this with the Average UK Earnings to arrive at the UK House Affordability Ratio which is shown below. Remove the credit boom and affordability continues to be range bound between 0.40 and 0.45 (represented by the orange lines) sitting right on 0.45 for this month. Over the month houses became slightly less affordable. The manipulated mortgage rates we see today are keeping UK housing affordable however as we saw in my preamble above and in my chart below Volumes are not healthy. This is likely caused by people prior to the recent Budget not having access to the high deposits needed to buy a house today. Remember pre Global Financial Crisis some Banks were happy to lend without a deposit. In my opinion the deposit requirements in percentage terms are high today because the Banks are now looking for deposits which can protect them from the risk of falling property values and the subsequent negative equity and distressed sellers that can go with that. This high percentage requirement then combines with high house prices to give big nominal numbers borrowers have to find. 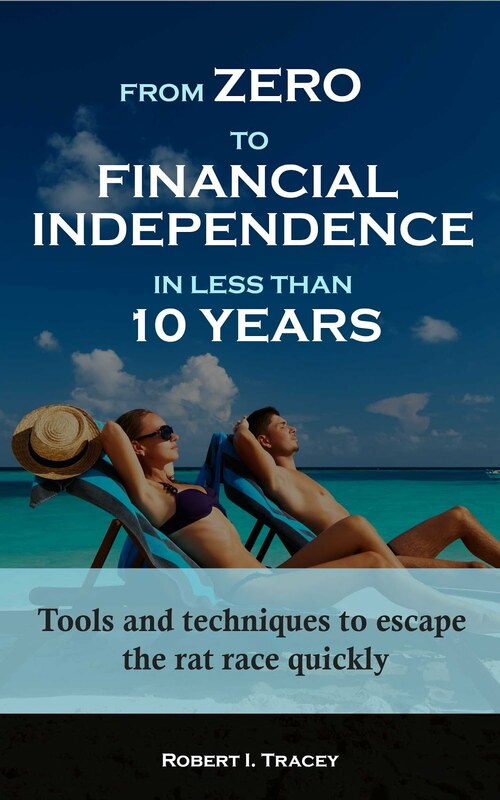 To demonstrate an average earner today would need to find 1.3 years of gross earnings to find a 20% deposit to buy a Nationwide Standard House. After tax and National Insurance that turns into 1.7 years of earnings. The elephant in the room is in my opinion house prices. Lower houses prices would mean low percentages being demanded by the banks as the risk of falls would be lower which would lead to lower absolutes having to be found by the average punter. Unfortunately the UK Government either doesn’t see this or more likely doesn’t want to see this. Instead as unveiled in the budget they are introducing the Help to Buy scheme which comes in two flavours. Option 1 kicks in tomorrow and briefly works by the taxpayer providing the borrower with a loan for 20% of the value of a new build property provided the borrower stumps up at least 5%. We have to wait until January 2014 for Option 2 but it briefly works by the taxpayer guaranteeing to the Banks 20% of the house value provided the borrower again stumps up 5%. Either way the Banks now get 75% LTV’s and so in theory should increase lending as a large amount of risk has now transferred to the tax payer. Under these schemes we would have to see house price falls of 25% before the Banks had to worry. While the Banks are partly covered I dread to think where this leaves the average borrower as a small 5% decrease (we have already seen an 11.5% decrease since peak) in prices will see negative equity, which is effectively mortgage and house entrapment, appear for them. I can’t see this scheme increasing house prices any further because it does nothing to help Affordability. That is in my opinion now all about mortgage rates. What will however be interesting to watch is whether it helps with volumes. In the interests of full disclosure I must highlight that I remain out of the UK property market. This is simply because I believe the market is overvalued and I try not to buy over valued assets. Interesting summary. 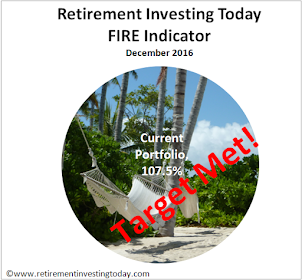 I think your P/E ratio should be based on the earnings that houses generate (i.e. rent), not average salary, since P/E ratios are calculated this way for shares. Your analysis disregards housing supply, but a P/E ratio based on rents would go some way to rectifying this as rents are affected by supply. Apologies if this has come up before, but are the average house prices a mean or a median? If they include multi-million pound houses in London then this won't be a very meaningful average, particularly if volumes of 'normal' 3-bed semis in the rest of the country are low at the moment. And surely prices in London and a few other cities are driven by international investors/cash buyers as much as local salaries? It seems a bit mad to treat the whole UK as one market. They are neither mean or median. The Nationwide uses a Standardised House for their Index. For further information have a read of the first link in the post which discusses all of the major UK House Price Indices including what they measure.